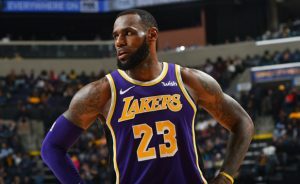 Wing Lebron James will miss all the Los Angeles Lakers matches by the end of the season in the National Basketball Association. Laker’s star has a groin injury and will not take part in all six meetings of the California team until the final of the campaign. “This is already being discussed with the medical staff, and it will be implemented by the end of the first year,” Lakers said. Los Angeles has no chances to qualify for the NBA Western Conference playoff. 34-year-old James missed 17 Lakers over the season due to various problems and injuries. LeBron James joined the 16-time NBA champions last July. The star contract is for four seasons. It is expected next summer that the Los Angeles Lakers leadership will try to attract Anthony Davis’s wing from New Orleans.